Admittedly, any mystery involving geometry does not sound all that thrilling (though this one does have a sweet video), I promise this one is. 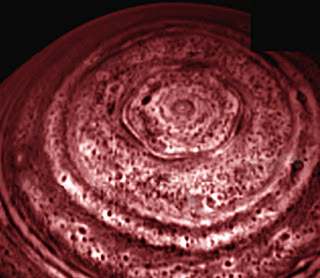 For the last 30 years astronomers have been mesmerized by why Saturn has a gigantic hexagon encircling its North Pole. Most of the distinct bands that characterize Saturn's surface are circular, formed by gas jet streams at various latitudes. However, when the Voyager spacecraft flew over Saturn in 1988, astronomers noticed that one of the bands is a very distinct hexagon with sides nearly the diameter of earth. Someone concocted a theory to explain the geometric voodoo and attributed it to a giant vortex along one of the hexagon’s sides. It sounded reasonable; the vortex was certainly big enough to manipulate the course of the planet's jet stream. But then when Cassini went back a few years ago, the hexagon was still the same as ever and the vortex was nowhere to be seen. Saturn's jig is up though. As explained by Science Now (in much more detail), using a little fluid dynamics some British physicists were able to reproduce the hexagon in their lab. They put a cylinder of water on a spinning table to simulate the planet's atmosphere and made a mini jet-stream inside the cylinder (the green dye) by placing a small ring in the water that would spin faster than the cylinder itself. They found that when the ring's speed increased, the jet stream became less round as eddies were formed on its edges. One of the group members told Science Now that they could create pretty much any shape they wanted including ovals, triangles and squares. The jet stream on Saturn is produced because it spins at a rate that happens to favor a hexagon. The group also says these forms have been seen in hurricanes for some time and they're generated pretty commonly in fluid dynamics. It's just no one bothered to let astronomers in on the secret. The BBC ran a story last week detailing how an amateur physicist from Brooklyn had successfully built his own fusion reactor in an empty warehouse in the heart of a residential neighborhood. In the video above you see a bubble detector picks up a tiny-dot, evidencing fast neutrons have been generated and hence fusion has occurred. I remember reading the story of the so-called radioactive Boy Scout a few years ago, a disenchanted teenager had managed to create a radium gun in his parents shed using americium-241 scraps from smoke detectors. In his attempt to build a breeder reactor, he nearly killed himself and irradiated his entire neighborhood to the point that the EPA had to disassemble the shed and put it in hazardous waste drums. Those kinds of nuclear materials aren't produced from fusion so it isn't dangerous in the same way, and that's part of the appeal. Two light nuclei fuse together to form a heavier nuclei and the process lets off a tremendous amount of power. While no one's managed to build a reactor that generates more power than it uses, fusion is widely regarded as a fuel of the future. Somehow, I doubt a web designer from Brooklyn pumping 30,000 volts of electricity into a device he assembled himself is going to be the one to crack the case. I'm guessing he won't harm anyone (good luck explaining to your spouse why you're dropping $40K on a science project in an empty warehouse), but some of the best and brightest minds in physics have been working on this for a generation and it's thought to be another 50 years away. So, I wouldn't bet on him. And he's not the only amateur doing this either. In fact, according to the BBC story he's the 38th person to independently produce fusion in a homemade reactor. I'm not saying I don't think it's awesome, but I thought the radioactive Boy Scout route was cool too – of course minus the inherent suicidal nature and general threat to the neighborhood. Neutral, immeasurably small and more common than Ray Bans on hipsters; and yet despite their abundance, neutrinos have proven frustratingly hard to nail down. In part, because they rarely interact with other matter and pass freely through everything around us. A group of physicists at Fermilab might have just made major strides in our understanding of neutrinos though. We've known for some time that neutrinos come in three varieties: electrons, muons and taus. However, in the '90s an experiment at Los Alamos suggested there could be another - the "sterile" neutrino, so named because it's even more reluctant to interact with matter. The idea is very appealing because it could answer the dark matter question and it's thought you would need to use gravity waves to detect them. But in 2007 a Fermilab experiment, named MiniBooNE, seemingly disproved the idea by failing to find them. But MiniBooNE brought the issue back to the surface earlier this month when it announced at a conference in Greece that it may have given up too soon on sterile neutrinos. While the Los Alamos group had used antineutrinos in their experiment, MiniBooNE had made use of neutrinos under the premise that the two should behave the same. Recently, the group decided to take a second look using the same method Los Alamos had and to their great delight, they found the same thing. A Fermilab physicist, Dan Hooper, suggested in a New Scientist article that the odd behavior might be a result of antineutrinos being able to change into sterile neutrinos, but neutrinos cannot. The same article also suggests that an apparent flaw in matter-antimatter symmetry like this could explain why there is more matter than antimatter in the universe. Many species use our planet's magnetic field to migrate across vast distances with incredible accuracy. Monarch butterflies move across the North American continent every season, spending winters in Mexico and California, and spreading throughout the US in summer as they pursue their host plant. Their journey is so long that by the time they reach their winter destination again, the population will be many generations removed from the one that left the previous year. Numerous other birds, insects and mammals accomplish similar feats of navigation every year, and physicists believe that quantum mechanics may lie at the heart of what makes it possible. A group of Austrian physicists published an article in Physical Review Letters this month explaining how they could enhance or reduce the performance of an animal's chemical compass using quantum entanglement. Entanglement describes a quantum mechanical state where two objects are connected in a way that prevents understanding what's happening with one object without acknowledging the other. What's spooky about it is that the objects can be seemingly separated and what affects one, will still affect the other. When a photon enters an animal's eye, it hits a magnetic receptor which produces a pair of free-radicals. These free-radicals interact with each other, as well as a weak magnetic field, causing a spin that allows the animal to "see" the magnetic field and give it a kind of compass. The quantum mechanical effects on the system are little understood and the team suspected quantum entanglement might play a role. They found that, theoretically, entanglement should play a role in navigation and could be very helpful for some animals. They also found that in some animals, such as European robins, it shouldn't play a role. The group says that comes from a need for short-lived free-radicals for entanglement to play a prominent role. So it appears there could be a strong relationship (in some animals) between entanglement and an animal's ability to orient itself in a magnetic field. Whether or not animals are actually using this relationship to migrate, is yet to be proven. A hundred billion stars here, a hundred billion stars there, pretty soon it adds up to some serious mass. Estimates of just how much mass the Milky Way contains have varied pretty significantly in the past, but one lone star may push up the upper bound for our galaxies weight. 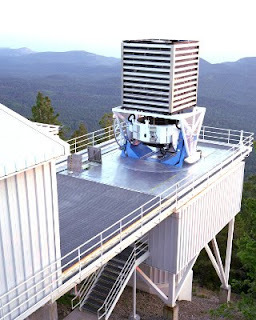 Astronomers in Germany found the fastest moving star ever seen in our galactic halo and say that in order for the Milky Way to hold on to it, the galaxy must have a higher mass than previously thought. Previous studies done by an international team of astronomers on 2400 stars in the galactic halo indicated the mass should be about 1 trillion times the mass of our sun. But the German team says this one star could throw out the earlier numbers. "It was immediately clear that this star must be something special and interesting," said team astronomer Norbert Przybilla in an interview with Physics World. 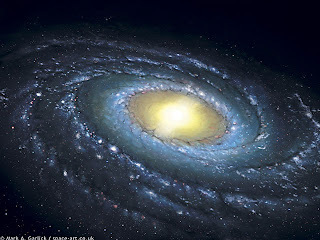 The astronomers say the Milky Way must have a mass at least 2 trillion times that of the sun. Otherwise, the star would have been flung from our galaxy, and it appears to have originated from the dark halo it's currently in. According to the group, this number confirms what some other astronomers have found. The star, which is flying through Serpens, is headed towards us at more than 400 miles per second (nobody panic!). That's three times faster than the sun moves and the only stars known to move faster have been catapulted by passing too close to the supermassive black hole lurking at the center of the Milky Way. In an interview with Physics World, the group said they hope an ESA spacecraft to be launched in 2012 will help clear things up. The spacecraft, called Gaia, will be capable of making incredibly precise distance and motion measuments for billions of stars. 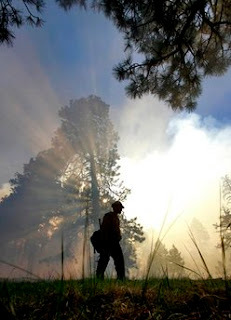 On Saturday, a 500 acre fire in Flagstaff, AZ was started by some guy, apparently lacking the foresight God gave pistachio nuts, who dumped his burning campfire coals on the forest floor instead of properly putting them out. The next day, some (presumably unrelated) equally responsible person left a campfire burning and just walked away. 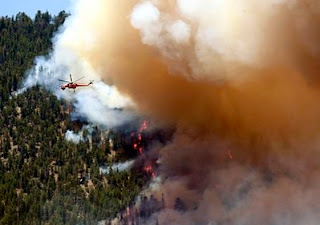 The first fire has stopped growing, but the second reached 10,000 acres in around the first 24 hours and is only 10-percent contained. As I blogged about a couple weeks ago, until June I'd been living in Flagstaff, AZ. If you follow the news you've probably seen it's now surrounded by fires and burning in the wake of my absence (you can see a live view of the smoke plume from the fire in my alma-matter's webcam). Perhaps a public service announcement/review of fire physics will help future fire starters realize why hot things burn and to put out their fires like every girl/boy scout knows how. Classically, the nature of fire is explained in a triangle that looks something like this. Heat is the bottom leg of the triangle, and fuel and oxygen compose the other two legs. If you deprive a fire of any of these things it will go out. Now that we've discovered that chemical retardants can put fires out, we know it's not quite so simple. When temperatures get sufficiently high for a material, something called pyrolysis takes place. This is where matter chemically decomposes through the action of heat. 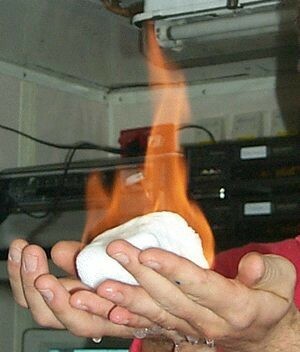 First, the combusting material starts emitting gasses such as water vapor. As the temperature increases, combustible gases start to ignite. Finally, when the temperature reaches a critical point we have ignition and the material burns. So, to account for these chemical aspects, some geometry obsessed scientist added a fourth leg and called it the tetrahedron of fire. Combustion, aka fire, is actually a chemical chain reaction dependent on external factors. By using a dry chemical retardant like potassium or sodium bicarbonate (similar to a fire extinguisher), you can cut off the conditions necessary for combustion to occur. You can still have all the fire triangle elements present, but the fire is inhibited by stopping combustion. What can you do to stop a fire? The fire must have one of its legs cut from it. You must remove the combustible material, lower the oxidation agent or cool the material beneath its ignition temperature. How can you prevent fire? Ask Smokey, but basically he'll tell you the obvious. Don't leave combusting material lying next to other combustible material. Lightning and other natural causes of fire aren't as frequent or problematic as the cause of these-human apathy. 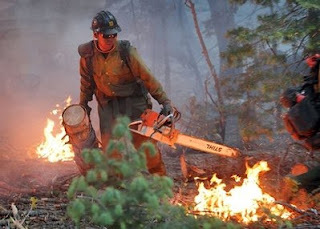 Check out this guy's blog for some incredible pictures of this fire. 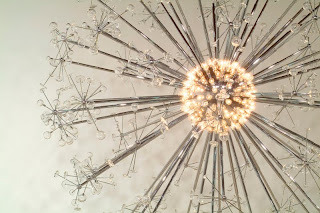 Maybe I'm thinking too deeply for a Monday, but last week's blog on science as art and a few too many museum outings had me contemplating the beauty of discovery all weekend. 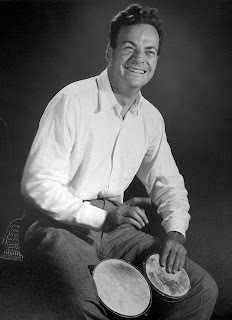 The great physicist Richard Feynman (of QED, Los Alamos, space shuttle, strip clubs and bongo drum fame), was enamored with the pure joy of finding things out. Feynman believed the beauty of science could outweigh what any poet or painter might ever imagine about the world. The deeper our knowledge of any question, the greater our enjoyment can be, he thought. And he had a way of taking this child-like fascination with the world around him and turning it into scientific discovery. 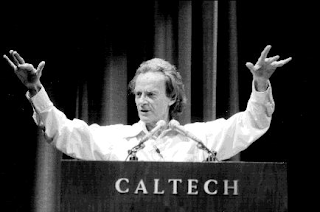 Feynman's Nobel Prize came from watching someone throw a spinning dinner plate in the Cornell cafeteria. Feynman noticed a relationship between the wobble of the plate and the rate of its spin, he worked out the equations for wobbles and eventually applied them to the spin of electrons. The implications for QED were profound and he received a Nobel for "deep-ploughing consequences for the physics of elementary particles." This playful fascination with the way things work made Feynman uncomfortable with the non-scientific world's view of science. The world is concerned with the use of things-what new cure or convenience will this discovery bring? Journalists express the weight of a discovery in terms of its utility, not in terms of the idea. His best example of this is that the radioactive phosphorus content in a rat's brain degrades by one-half in a period of two weeks. A journalist would express such a find in terms of implications-this might help lead to a cure for cancer. But the underlying beauty is in the idea of the thing. A scientific appreciation for the concept itself leads to a far more enticing conclusion; the molecules in your brain are constantly being replaced. You have memories from years ago, and yet the molecules in your brain are new. Such an idea tugs at the nature of consciousness. If our body is made up of different parts then it was years ago, what makes us who we are? yet forming white surf in unison. City approves first U.S. law requiring retailers to notify customers about cell phone radiation. San Francisco is set to be the first in the nation to require that retailers tell consumers how much radiation their brain will absorb from new phones. The ordinance -- approved on Tuesday and now awaiting Mayor Gavin Newsom's signature -- is an attempt to err on the side of caution in the debate over whether or not cell phones can cause brain cancer. Despite numerous studies, medical researchers haven't found conclusive evidence that cell phones increase the risk of brain cancer, and many physicists say that there's no need to investigate a possible link between mobile phones and cancer because the radiation emitted by the phones theoretically can't affect brain tissue. California politicians, however, have moved to act preemptively in response to public concerns over the often contradictory reports. "The science is in, if there were no concern there would be no limit," said state Sen. Mark Leno, D-San Francisco, in a floor debate on similar statewide legislation." The federal government did determine it was an issue of concern because in 1996 it set a maximum limit on the amount of this radiation that can be emitted." In early June, Sen. Leno introduced a nearly identical bill in Sacramento. The bill made it out of committee, but died on the senate floor and even a revised version that only required online retailers to list the numbers was voted down. While there were more ayes than nays, eight members refused to vote on the measure and it failed to meet the necessary 21 votes. When the new legislation was introduced during last week's San Francisco Board of Supervisors meeting, members voted to delay considering the ordinance until Tuesday amid accusations from other board members that they were caving to industry and retailer lobbying. According to the National Institute on Money in State Politics -- a nonprofit that tracks the influence of money on public policy in all 50 states -- the wireless phone industry donates millions to California politicians, with much of the California state Senate receiving donations varying from $1,000 to as much as $27,000 from AT&T Inc. every election year. Manufacturers are already required to report to the Federal Communications Commission the maximum amount of radiation -- called the specific absorption rate -- that each phone emits. According to Joel Moskowitz, director of the UC Berkeley Center for Family and Community Health, this current maximum allowable amount is based on the amount of radiation that the brain of a 200 pound man would receive if he talked on a cell phone for six minutes. Leno's argument, as well the Board of Supervisors' and other politicians supporting the new laws, is that the information should be provided to consumers directly until a scientific consensus can be reached. They say that finding the absorption rate for a particular phone is currently too difficult. However, many scientists and industry officials believe the new requirement amounts to misleading the public into thinking there's a reason to be concerned. "What this implies is that we should just ignore the fundamental laws, because there just isn't any mechanism," said Robert Park, a University of Maryland - College Park physicist. "This is an announcement that something is wrong and when you haven't found anything wrong this just erodes public confidence in warnings." In an editorial featured in the Journal of the National Cancer Institute, Park explained that most physicists don't believe there could be such a link because there is no known mechanism for cell phone radiation to damage the body. Molecules in the body absorb radiation as energy packets called photons, but in order to cause cancer the DNA has to be mutated by a breaking of chemical bonds. The amount of energy these photons pack is determined by the wavelength - the shorter the wavelength the more energy a photon will have. So, a photon has to have significant energy to be capable of breaking these bonds. However, cell phones transmit information over a radio frequency that sits somewhere between AM radio and the average microwave. While this non-ionizing radiation can heat tissue, Park argues that it can't provide enough energy to break chemical bonds -- regardless of the radiation’s intensity. In fact, not until the ultraviolet part of the light spectrum do photons have enough energy to mutate DNA. "Everyone knows that cancer agents act by creating mutant strands of DNA which then grow as a cancer," Park said. "Without creating a mutant strand of DNA there's no way this could cause cancer." Some epidemiologists believe there is strong evidence for a link between certain types of brain tumors and cell phone use, but no one has established a mechanism to explain this connection. Moskowitz examined a collection of studies that explored this link and was troubled by his findings. In the Journal of Clinical Oncology, Moskowitz reported significant discrepancies between studies his team identified as being higher-quality independent studies and studies that were either low-quality or done by the cell phone industry. While the independent studies showed a significant risk of brain cancer in heavy, long-term cell phone users, Moskowitz said the industry-funded research tended to actually show a protective effect. Their studies indicated a reduced risk of brain cancer associated with heavy use. "It's almost a 'darned if you do, darned if you don't' situation," said John Walls, vice president of public affairs for the cell phone industry group CTIA. "If you do the research, you're criticized for industry doing the research and if you don't you're criticized for not having studied it." Walls says that while the industry has funded studies for years, many of the largest studies have been carried out by the government on the industry's dime with what he calls a "stringent firewall" between the research and the money. Walls also points out the most recently released study, the World Health Organization’s Interphone report, examined more than 10 years of data from 13 nations and showed nothing conclusive. However, several researchers, including Moskowitz, have pointed out several pieces of the report they claim the team misinterpreted to underestimate the risks. The Interphone report was funded in part by a European cell phone industry group. "I don't see how SAR labels will mislead consumers as the cellular industry claims," Moskowitz said. "The industry is being disingenuous. They issue safety warnings in their instruction manuals, but often hide them or try to get consumers to ignore them." While cell phone companies have never publicly agreed that there is a risk, cell phone user manuals can paint a contradictory image. The Blackberry Pearl manual recommends keeping the cell phone at least an inch away from the body, including the abdomen of pregnant women and also claims that using a non-certified belt-holster might present a risk of serious harm. The same manual also suggests turning the phone off when in a breast or pants pocket, using a hands-free device, text messaging whenever possible and "limiting the amount of time spent on the phone." Walls says that the cell phone industry isn't aware of any health risks associated with using cell phones and these kinds of warnings in cell manuals are just a way of avoiding liability. "There's no difference in one device versus another as long as they both comply to the stringent standards of the FCC," Walls said. Some companies have sought to capitalize on the public confusion by creating devices that supposedly limit radiation exposure. One such company, Pong Research, sells phone cases that are FCC certified to reduce the amount of radiation your brain will absorb while you're talking on it. "Cell phone radiation is a form of energy. Energy that you don't want anywhere near your head," the website claims. Another company, Belly Armor, makes t-shirts and stomach bands designed to shield pregnant mothers like a Faraday cage from "everyday radiation." The company also makes blankets designed to be placed between a pregnant mother's stomach and a laptop, citing unsubstantiated health risk claims like autism, leukemia, cancer and even miscarriage. "I've got constituents that are dealing with very serious health concerns and they are 100-percent convinced that it's because they had (a cell phone) to their brain for 20 years," Leno said in the same floor debate. "I'm not here to confirm that correlation, but with all the questions here why would we not want to require that … the SAR be shared?" For two years in college I lived with art majors and whenever I didn't like a piece of abstract modern art I got cut-down for some absurd thing like being too scientific and not creative enough. I've always looked at it like Feynman, understanding the science behind how the world works gives you a greater appreciation for the beauty of a flower or sunset, and most certainly the cosmos. 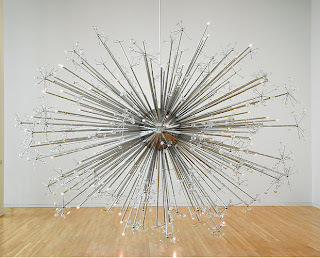 You may have seen Josiah McElheny's art before, but cosmologist David Weinberg put a paper on arXiv last week that explains the science behind it. 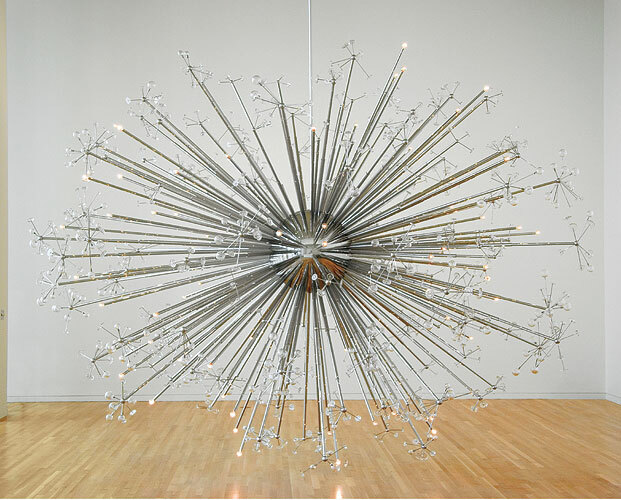 If you haven't seen it before, McElheny (a prominent sculptor) received an art residency at Ohio State University and worked with Weinberg (an accomplished OSU cosmologist) to create an accurate artistic version of the big bang. While the photos make it look like an explosion (not at all how to think of the big bang), they actually have a really cool explanation to accompany the pieces. The center represents the origin of the universe and the outer edge represents the present day, moving from one end to the other depicts the entire 14 billion year history of the universe. 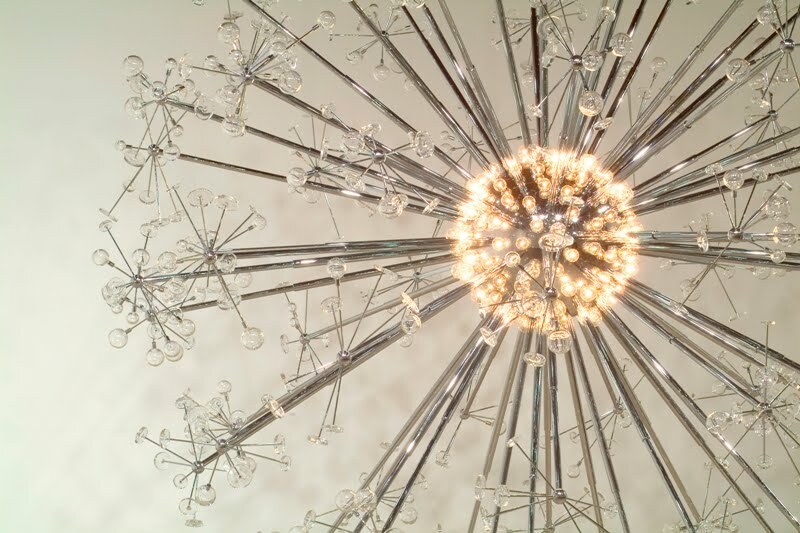 The sculpture has 230 rods coming off of it, each with its own random length ending in either a group of exquisite glass discs and globes, representing galaxy clusters; or a single lamp, representing a quasar. We must then use our imaginations to picture them surrounding by immense amounts of dark matter, which we know exists based on its gravitational influence on such objects. The rods emerge from a center sphere, which depicts the surface of last scattering, a dense fog of electrons that made the early universe so opaque it's now the most distant source of light we can see (i.e. the cosmic microwave background radiation). The big bang itself is hidden behind the central aluminum sphere, just as we can't see the actual big bang because of the surface of last scattering. 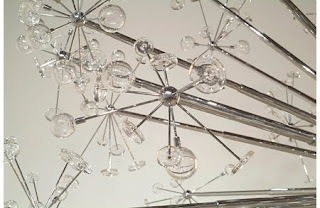 For scale, each 7.2 inches of the sculpture corresponds to a factor of 2 times cosmic expansion, giving the piece a 1000 fold growth at its outermost point. So, the first galaxies in the piece are suspended on rods 3 feet from the origin, or 100 million years after the big bang. As the rods get increasing farther from the center, the galaxies get larger and clusters of them emerge, and the galaxies take on increasingly complex elliptical forms. The actual lights on the end of the rods represent quasars, our universe's brightest objects, which are fueled by supermassive black holes and can be a thousand times brighter than the galaxies they're at the center of. 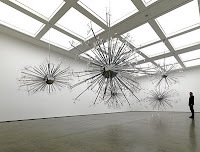 The lamps closest to the center are the faintest because there hasn't been enough time to build these supermassive black holes, the lamps get increasingly brighter as the rods move farther out. The intensity of the lamps decreases again though as the frequency of interactions between the black holes decreased after several billion years. "Because light travels at a finite speed, astronomical telescopes function as time machines: when we observe distant objects, we see them not as they are today but as they were when they emitted their light. This fortunate feature of physics allows us to build an empirical picture of the history of the universe from observations at the present day. An End to Modernity represents the principal elements of this picture — the Last Scattering Surface, the growth, transformation, and clustering of galaxies, and the rise and fall of the quasar population — in idealized but qualitatively accurate form." I'm sure most people just see it and think woah! But here's definite proof - having knowledge of science can improve your aesthetic sense. 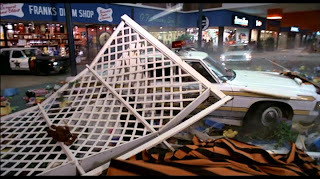 In my continuing list of things to blame physicists for, we can now add the near crash of the global financial system. Apparently, the volatile investments called derivatives, which resulted in some of our largest banking corporations going under and the massive bailout of countless others, was all the idea of some punk physicists trying to make it rich on Wall Street. While the guy who actually brought the idea to the Chicago Mercantile Exchange some decades ago wasn't a physicist, apparently we still get the wrap for pushing it with that spell-binding thing called math. "They are complex, in effect, mortgage science projects devised by these Nobel-tracked physicists who came to work on Wall Street for the very purpose of creating complex instruments with all manner of detailed protocols, and who gets paid when and how much. And the complexity of the structures is at the very center of the crisis of credit today." What's more startling? They were already predicting that it would be our fault in 1995. Some whiz kid PhD physicists and mathematicians were recruited by investors to make use of the computer technology that had become available to model investments and bring a risk management element into the world market. The idea was that a derivative, if based on the best data, could insure everyone against falling prices by allowing them to hedge their bets. The problem with the logic though, was that it assumed all of us humans would make rational decisions in our real estate and other investments. Instead, to their surprise, people started buying more than they could afford on the assumption that prices would continuously go up. The price continued to rise while the value dropped until suddenly someone realized that the investments were of no value and everyone sold at once, effectively dropping the price to zero. A number of people tried to warn the public off about what derivatives were doing, but you know us physicists; our diabolical plans can never be thwarted once we've set them in place. So, all the physicists got rich while the poor investment bankers sat there and helplessly tried to warn the world. Wait, no that didn't happen. Oh well, it was still our fault. 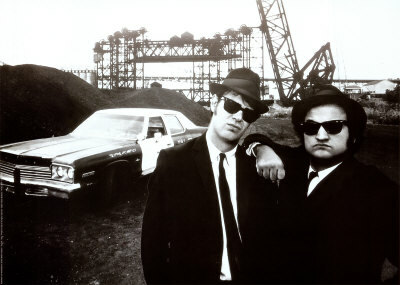 So, what's next on our list of things to destroy after the Gulf of Mexico and the world financial market? How about the very earth itself, after all that is why we built the LHC. Paper is an enduring medium. Much of what we know about our history has stemmed from scrolls, scraps and pieces of parchment that have lasted millennia. But when exposed to the wrong conditions or made on the cheap, paper degrades quickly. Everyone can distinguish the smell of such a book, walking through a library or old book store you can often pick out the musty, earthen smell amidst the stacks. A team of European researchers has found a way to capitalize on that pungent smell to help preserve and protect old books and historic documents. 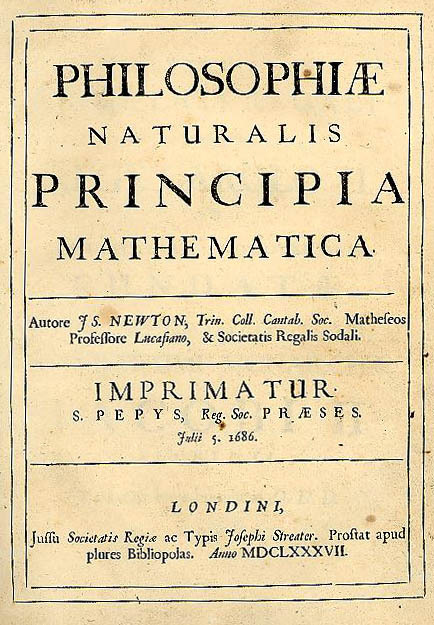 The team made use of physics based techniques like spectroscopy, gravimetrics (a complex way of determining mass), and a number of analytical chemistry techniques, to very precisely examine the way old books smell. Not all documents can be protected like they were the Constitution, and eventually years of exposure to sunlight, humidity and heat cause the paper to out-gas several hundred different types of volatile organic compounds (VOCs) as time takes its toll. VOCs are responsible for the way an old book smells and through their analysis the team found a way to precisely determine the condition and stability of paper. This smell test can do away with more destructive tests that require cutting off pieces of precious works to determine the damage. By examining the organic compounds coming off the paper from a small distance away, the smell test lets the researchers know what steps need to be taken to save it. The technique can also save much needed time and resources. Simply going off smell, a librarian could determine which books are the worst off and focus their energy on those works first. When the winners of the 2010 APS Laserfest video contest were announced last month, there was one name noticeably not on the list-last year's winner James Lincoln. The guy can make a pretty good video and he's as enthusiastic about physics education and the promotion of women in physics as anyone we've come across. His video was great too, but this year's contest had a lot of incredible entries. So, when James emailed us asking for an honorable mention, we thought we'd throw him a bone by doing a profile of him on the Physics Buzz blog. We like you James, so here's your honorable mention. Physics Buzz: What do you do? Are you a teacher, student, a dedicated physics geek etc.? James Lincoln: I am a teacher; high school and college, mostly high school. I am also researching in the history of physics and in physics education specifically differentiated instruction based on gender. In history, I focus on the origin of the symbols we use in physics. I knew in high school that I was going to be a physics teacher. I majored in physics at UCLA planning to be a teacher, then when I graduated (early) I went into their Masters Ed. Program and began teaching during my fourth year of college. I also have graded the AP Physics Tests three times. I think I was the youngest grader ever (you need 3 years teaching experience minimum). I recently got my Masters in Applied Physics at CSULB, focus on Physics Education and Gender. I am starting a website: www.physicsforgirls.com. I am very dedicated to physics education. I recently was elected Vice President of the Southern California American Association of Physics Teachers, in charge of high schools. I regularly present for AAPT and am presenting twice at the national meeting in Portland this summer. My presentations are "Noticeable Errors in Artificial Gravity of Rotating Space Stations" and "The Etymology of Phyics Symbols: Why Does This Stand for That?" The second of these I am very excited about. PB: What gets you psyched about physics? JL: At first I only liked one type of physics - mechanics. But, as I spent more time with each field I discovered that there are exciting things in each. I always liked high energy particle physics, but it took me a long time to like quantum mechanics. The way into QM for me was learning the history of how it was created. Once I learned that, I became much more focused. Eventually, I became an independent history of physics researcher. It really helps my teaching. I would definitely say that the history of physics is what gets me excited about things these days. PB: How do you make your videos, what's your source of inspiration and goals when you start? JL: Usually there is a topic, for example lasers. I start by thinking of all the demonstrations that would be most helpful for people to understand a topic. Then I make sure to remove the obstacles to learning (no black boxes). Then I focus on putting things in an order that makes the most sense and look for a central theme. Once I choose how the demonstrations will work I storyboard the whole project and dialogue. We film multiple takes with different emphases and attitudes. Lastly, while we are filming we listen to ourselves making music that would be appropriate for the images we are filming. The editing takes forever, but it's an extremely important part not to skimp on. Most of the demonstrations are ones that I have never heard of before. I think it's really important for people to see them, especially because I perform them all live, and show that anyone could do them. PB: How many science videos have you made? Was last year's entry your first one? JL: No, I have been making videos for years, since high school, when I was the science club president. My friend Adam and I made an awesome documentary on Hydrogen, you know, the element. I always have ideas for new projects; I am looking into some grant ideas right now. PB: Thanks James, the videos are great. JL: Thanks. You will have to thank my brother Chris, too. He helps a lot. For example, the music in my LaserFest video was suggested by him - a perfect fit! We'll see you in Portland James!!! The Millennium Technology Prize, which is like the Nobel of the tech world, was given out Wednesday for a crazy solar cell that can make renewable energy on the cheap. The Graetzel's cell, named for prize-winner Michael Graetzel, eliminates the need for extensive manufacturing of solar cells by capturing the sun’s energy with a sort of artificial photosynthesis. It works like this: an ultrathin layer of titanium-oxide nanoparticles is laid down and then covered with dye made from berries that absorbs the sunlight like chlorophyll in leaves. Simple enough, but it's a cool way to make a thin-film solar cell. And the simplicity means it can be made in mechanically sound, flexible sheets without worrying about trees falling on them or hail shattering its casing. It's not as efficient as the current photovoltaics in use, but it's cheap enough that it more than makes up for the loss of energy-per-foot. The technology and resources needed for solar panels until now has kept our most abundant energy source from outcompeting fossil fuels, so there's some obvious money to be made if these can be produced large-scale. Supposedly, the EU has plans to incorporate them into its solar energy roadmap, so they may be a significant source of solar power in the next decade. Although, Graetzel won't need it too much, the prize comes with a million dollars. Two people got runners up awards from the Millenium Prize: Sir Richard Friend (yes, he is a knight of physics) for his organic LEDs that made ebook readers a reality, and Stephen Furber who invented the microprocessors in our cell phones. The Big Bang occurs; within 10^-37 seconds the universe undergoes inflation and expands exponentially as it becomes homogeneous; symmetry breaking follows and sets the laws of the universe in place as we now know them; by the time the universe is one-millionth of a second old it's cooled enough for a (still very hot) plasma of protons, electrons etc. to form; the temperature plunges in the universe as it expands, when it reaches 5,000 degrees Fahrenheit it enters the Recombination Era and electrons and protons can finally stick together to make hydrogen atoms the epoch leaves behind the Cosmic Microwave Background-radiation (CMB) as evidence of its existence; eventually hydrogen leads to stars, planets and you and me… We all know the rest of the story. The Era of Recombination part of this has been of great interest to physicists in recent years as it's become pivotal to our understanding of how the universe formed. When Penzias and Wilson famously stumbled across the CMB in the 1960s, astronomers had already been expecting it for 2 decades. The CMB served as an early validation for the then controversial Big Bang theory and over the last decade, numerous NASA missions have successfully mapped its temperature and distribution in impressive detail. However, while the logic for why the CMB exists has been well established, the exact formation mechanism has been less well understood. New research, published in the journal Physical Review A last month, should help to give a more accurate explanation of how that happened. The first simple atoms couldn’t form until 400,000 years after the Big Bang when the universe had finally cooled down to something like the temperature of the Sun’s surface. The first atoms would have had incredible difficulty forming. As protons and electrons dropped energy states in the process of recombination, they would release a photon. That photon could easily excite a nearby atom and turn the whole process back to where it started, repeating the dance over and over as it coupled radiation with matter. As this paper details, radiation escaped coupling through a process called two-photon transitions. This is when two photons interact to excite a molecule from one state to a higher state. After this transition, recombination could occur, leading to what we now see as the Cosmic Microwave Background radiation. In May of last year the president ordered a review of NASA's human space flight program. His panel eventually concluded the space shuttle should be grounded and NASA's resources should be moved toward private spaceflight, setting the stage for a new rash of criticism for the president. Normally dormant space legends like Neil Armstrong, Gene Cernan and James Lovell awoke from a long sleep to openly ridicule the president for retiring the space shuttle, putting a lot of people in Texas and Forida out of work and rerouting American astronaut flights through Kazakhstan. The astronauts claimed that Obama's plans to abandon a return to the moon were misguided and balked at the idea of depending on developments in private space flight to get us into space. "If the leadership we have acquired through our investment is simply allowed to fade away, other nations will surely step in where we have faltered,"Neil Armstrong told a senate committee in May. "I do not believe that this would be in our best interests." So, after much criticism for changing the course of American spaceflight to depend on a burgeoning, yet unproven private space flight industry, President Obama received some justification for his plan with the successful launch of SpaceX’s Falcon 9 rocket last week (see below). 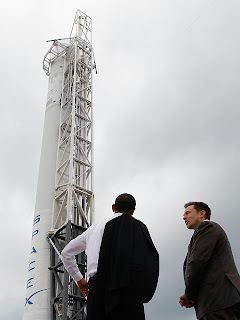 "I think this bodes very well for the Obama plan," Space.com reported the company’s CEO, Elon Musk, as saying after the launch. "It really helps vindicate the approach he's taking." While the launch is just one event from one small company, it represents a major step in demonstrating that a private company is fully capable of delivering a payload to space and doing so for far cheaper than the government. Musk, who made millions from starting and selling the internet company PayPal, has also announced that he plans for the maiden launch of his Dragon capsule later this summer. The Dragon vessel is designed to bring cargo and astronauts to the space station, which Musk says he expects the craft to be ready for in the next 2-3 years. 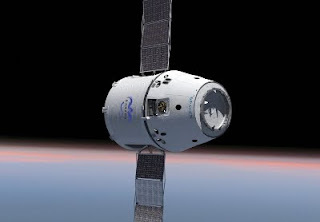 The success of the Dragon vehicle and its rivals are critical pieces in Obama's space plan. Though both Bush and Obama planned to retire the aging space shuttle fleet once the ISS had been completed, Bush’s plan would have relaxed the need for the shuttles by phasing out ISS. Obama's space plan keeps the ISS going likely until 2020, so having the ability to get to and from low-earth orbit remains critical despite our lack of ability to do so independently. The president has also canceled the Orion vehicle program which was slated to take humans back to the moon by 2020, instead placing emphasis on traveling to an asteroid and then eventually Mars. While these larger projects are still remaining inside the space agency and not being farmed out to the so called "new space" industry, the coming years of NASA projects will depend on being able to shift its focus out of low-earth orbit and out into the solar system. Sometimes you just have to say "sorry." It appears that it's my turn. 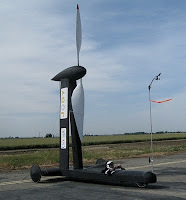 Yesterday, I saw a story on Wired touting the first full-scale demonstration of a wind powered machine that can move faster directly downwind than the wind itself is moving. The piece instantly got my perpetual motion scam meter ringing. So I did what any well-meaning physics fan would do -- I flamed the shysters in the comments section of the article. I now know I was wrong. I spent most of last night a drawing up page after page of force diagrams and pouring over videos like this . . .
. . . in an attempt to figure out how they managed what was clearly a deception. Instead, I have seen the light. I'm convinced that Rick Cavallaro and his buddies at Thin Air Designs and San Jose State University deserve a hearty pat on their collective backs for sticking with their convictions. My belief that outrunning the wind is impossible stemmed from hours on sailboats as a kid. You can build up a lot speed while tacking across the wind, as these folks demonstrate. But running with the wind always seemed so dull and slow. I tried endlessly to think of some way to speed up my downwind motion. I talked to countless sailors and physics profs, and ultimately came to terms with the inevitable fact that there's no way to sail faster than, or even at, wind speed if it's blowing straight at your back. That fact still holds true for sail-powered vehicles. Cavallaro, as it happens, didn't build a sail boat, or sail car, or sail anything. 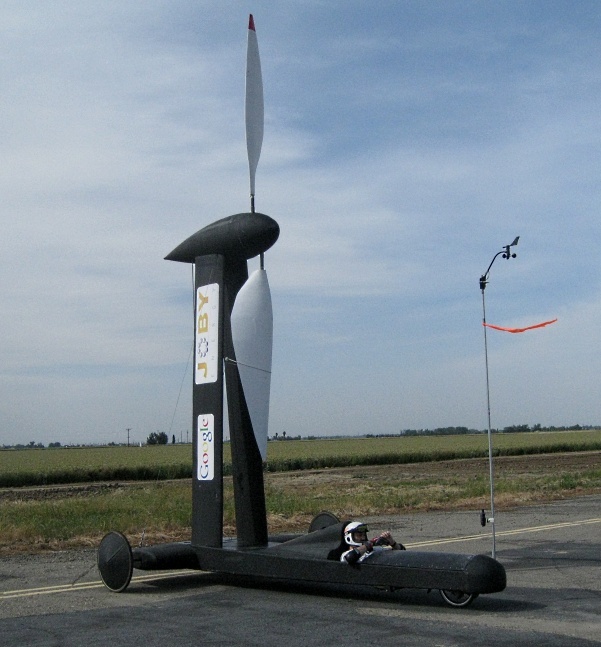 I'm not really sure what to call it other than a faster-than-the-wind vehicle. 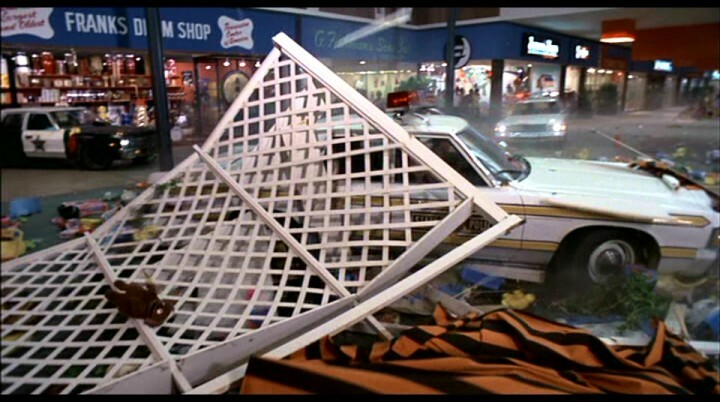 The problem with the new vehicle is at least in part the challenge of explaining the physics of the thing. In short, it exploits the difference in the motion between the air and the ground. There's absolutely nothing wrong with that. There's no perpetual motion or free energy involved. Once you take energy out of the system, you're free to use it anyway you like, including outrunning the wind. If you can use a windmill to collect energy when your sitting still, then you should be able to continue collecting energy when you're moving. You just have to be clever about how you do it. The key to the new vehicle is that part of it has to be connected to the ground and part has to be immersed in the air, and that there has to be relative motion between the two. In other words, you can't have a a propeller scavenge energy from the wind in order to turn a propeller that moves you along. Nor can you have a wheel that steals energy from your forward motion over the ground in order to turn drive wheels that move you forward. Those would be examples of perpetual motion machines. I could, however, build a machine that has a paddle wheel immersed in a running river and wheels on the adjoining shore that could outrun the river that powers it (maybe Rick Cavallaro could make one of those next). It would be a tricky thing to design, but it should work just fine. I freely admit that my 180 degree conversion from yesterday to today has me a little nervous. If I could be so convinced that outrunning the wind was impossible at one moment, and then convinced that it's entirely possible only 24 hours later, then what's to guarantee that I'm right now? Epiphanies are like that I guess. But just to make sure, I'm going to build a model myself. Once it's done, I'll show it to my friends and colleagues here at the American Physical Society to see what they have to say about it. I'll report back as things progress. I thought it was odd when Discovery Communications gave a certain former Governor known for her love of hunting wolves from helicopters a show on Alaska and its wildlife. But now Discovery's Science Channel is premiering a show this week called “Through the Wormhole,” hosted by Morgan Freeman. How could I possibly have any problem with Morgan Freeman? Well, as an actor I think he's incredible, but judging from the interview he gave on the Daily Show last week, I think Morgan Freeman may have never emerged from thinking he was God. Throughout the interview, Freeman frequently invokes what he calls the "God factor." The argument goes like this: if science doesn't understand something, then it must be the work of God. The argument is as old as society itself and (unfortunately) it's still very much alive in America today. Many people use such arguments to challenge evolution, attempt to debunk climate change and place the age of the earth at 5,000 years. Who cares what Freeman says off the show? Well, when Through the Wormhole premiers on Wednesday night its first episode will take on creation by invoking some mathematical underpinnings of physics to look for evidence of God. As a religious person I recoil at these types of arguments, science and religion are not in competition. Every time science makes a discovery it isn't chalking one up for atheism because one more thing is now explained, like God's existence must be confined to the bizarre or supernatural. Stewart: Do scientists now feel like they know what happened and where we came from? Freeman: There are scientists that feel like they have a very clear sense where we came from, and then there are other scientists that feel like those other scientists that feel they have a very clear sense where we came from have no idea what they are talking about. Because we don’t have a very clear sense where we came from. There are a lot of different scientists with different ideas, different thought patterns and different takes on the evidence we have. S: They talk about how there's five times the amount of dark matter and dark energy in the universe than there is regular matter and energy, but what the hell does that mean? S: And they say it's holding us together but what is it? F: How? Right. Yeah, these are the questions that I like to ask also. S: Well, What do they tell you? F: This is where we get into the God part of it. You know, whatever scientists don’t know becomes a God factor. S: And they will even say that? F: Yeah, we get to a point when we say 'well we don’t know how that happens'. S: So after all these years and the incredibly sophisticated tools that we use to scour the skies, they just come back to basically, 'I think the sun God did it'? Now, people are entitled to their views and their misconceptions by the first amendment. However, Discovery Communications has an obligation to portray science accurately as a major player in the science media. What makes it worse is that the topics Freeman claims scientists don't understand and attribute to the God factor, are more like things that Freeman just doesn’t seem to get. Mainly, dark matter and dark energy. Which is strange because in one of the show excerpts posted to Through the Wormhole's website, there's a very good explanation for what we think dark matter is, why it's so hard to detect and how scientists are attempting to find it anyways (maybe he should watch his show). So, perhaps Freeman isn't exactly Alan Alda and is really little more than a deep and distinctive famous voice, I'm still reluctant about Wednesday's show if it's looking to science for the existence of God. An outlet billing itself as a science channel should be cautious about making scientific theories dependent on God. Even the Catholic Church would agree. The Lexus LFA is a nice enough ride, I suppose. What's not to like about 500 horsepower supercars? 'Course, it has too few seats for me (only two). Oh yeah, it also costs $375,000!!!! But that doesn't mean this video about the physics behind the LFA ad isn't still really cool. What I need now is a behind-the-scenes explanation of why you have to make ads to sell an ultra expensive, very limited production supercar. Do oil Sheikhs watch much TV? As reported yesterday in the WSJ, astronomers in Antarctica are building a telescope out of ice on the Earth’s southernmost continent. The project is being headed by the University of Wisconsin and is expected to cost a cool $270-million, with NSF covering the vast majority of funding. 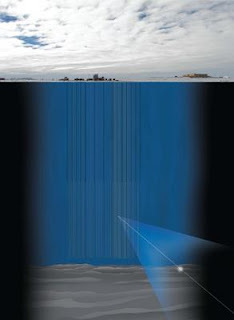 Appropriately called Ice Cube, the project will use one square kilometer of ice to create a detector that can glimpse the rare instances where water-ice atoms and neutrinos collide. The astronomers can then use their observations to do something that has never been done before-create a neutrino map of the sky. The mass of a neutrino hasn’t been precisely determined yet (more on that in a minute), but they are strikingly small. The subatomic particles can pass through solid matter at nearly the speed of light without having a collision. Neutrinos are more common than even protons and neutrons and these high-energy neutrinos frequently emanate from cosmic explosions, such as gamma-ray bursts. In the rare event a neutrino does collide with an ice atom, the interaction creates a muon and because the ice is so transparent, Ice Cube can detect the blue light of the nuclear reaction from hundreds of yards away. This data is then fed to scientists at 35 labs in seven countries for analysis. Scientists will be able to track the direction of the neutrinos that pass through Earth and reveal their cosmic source. Antarctic ice is incredibly pristine and free from impurities and more importantly, it’s free from radioactivity, making it the perfect environment for neutrino detection. The detector faces a daunting problem though-muons produced by cosmic rays outnumber those from neutrinos by a ratio of a million-to-one, so the detector has to use earth as a filter. Because neutrinos are the only known particles that can pass through the earth (and our bodies too!) Ice Cube scientists know collisions can’t be from bombarding cosmic rays. 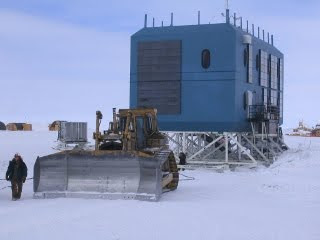 But, to shield their instruments from the natural background radiation at the surface, the top layer of detectors had to be placed 1.4 kilometers deep in the ice. Once placed, the ice melted back around the 5,000 sensors and froze them in place for the next 25,000 years, or roughly the amount of time it will take for that chunk of ice to migrate to the ocean. Also, in a Physcial Review Letters article last month, cosmologists from University College in London placed tighter restraints on just how small neutrinos might be. Because neutrinos are one of the most abundant particles in the universe and are flying all around at nearly the speed of light, cosmologists think they must play a large role in the cosmos. Until we understand them better though, it’s hard to know how large that role is. Using a survey of how galaxies are distributed across the universe, the group was able to determine an upper limit on the neutrino’s mass. They created and studied the largest 3D map in existence (containing 700,000 galaxies), called MegaZ, by using the redshift of galaxies in the Sloan Digital Sky Survey to determine their distances. The group combined their survey information with temperature fluctuation measurements from the Cosmic Microwave Background radiation to determine that the mass of a neutrino must be less than one billionth the mass of a hydrogen atom. The results also indicate that current to next-generation experiments to determine the mass of a neutrino, such as the German instrument KATRIN, are unlikely to detect anything.